Deterrence or Escalation? – Nuclear Weapons under International Law. 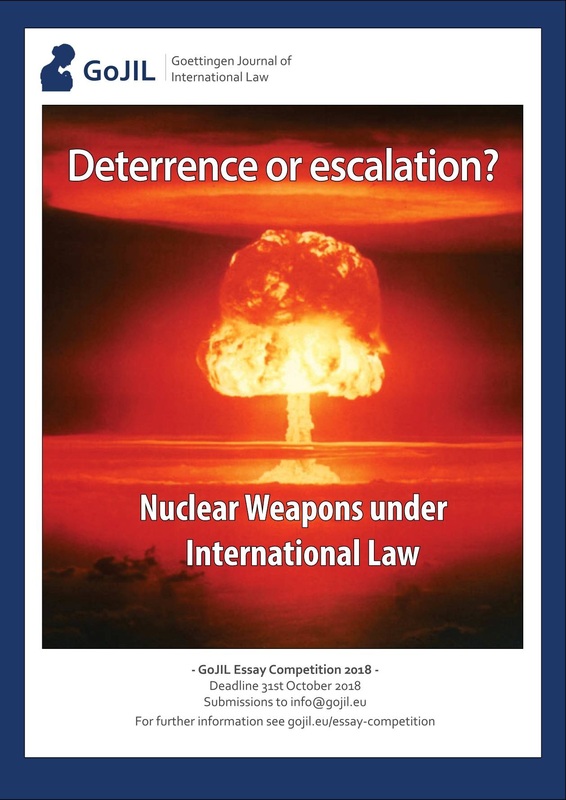 Between almost universal ratification and deadlock: Which legal value and which impact on political decision of nuclear powers does the Treaty on the Non-proliferation of Nuclear Weapons have? How relevant and effective is the Treaty on the prohibition of nuclear weapons? Does the changing role of the United States regarding nuclear safety, as seen in the unilateral cancelation of the Iran Treaty, impact the effectiveness of similar agreements? Not only papers that address aspects of the research areas listed above are encouraged but all papers that illuminate the legal situation of Nuclear Weapons, e.g. concerning the International Humanitarian Law, International Human Rights Law, International Trade Law or Cultural Heritage in International Law. The GoJIL invites you to actively take part in the scientific discourse. The deadline for submission is 31st October 2018. The maximal word count is 5000 words (excluding footnotes). The winning submission will be published in an upcoming issue of the GoJIL. GoJIL gives young scholars the chance to gain practical experience and get their own professional scientific publication. To make this possible, GoJIL hosts an annual Student Essay Competition on a current topic of international law or its related fields. We strongly encourage you to take advantage of this great opportunity and hand in your submissions.